In the past few months, I had the pleasure of working with the talented and fabulous hair stylist, Kathy from Hair Kstar and the brilliant photographer John Brewer. He has photographed countless professional models in the fashion industry, including Tyra Banks! While I had lots of fun working with both in the studio, I also cherished the moment of collaborating with them as they contributed to make the magic happen. 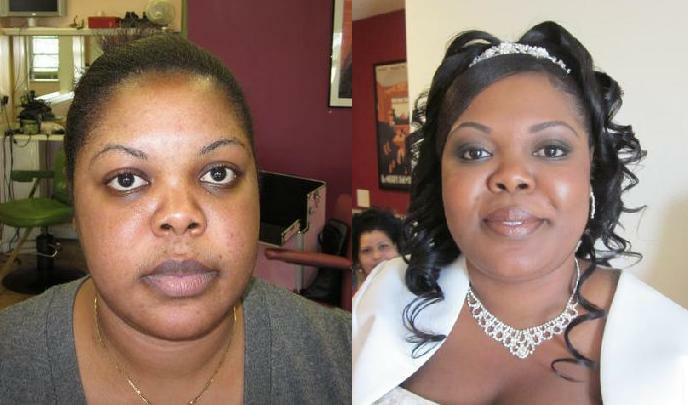 As we all know, a bride doesn’t look picture perfect simply by the work of good makeup artist. 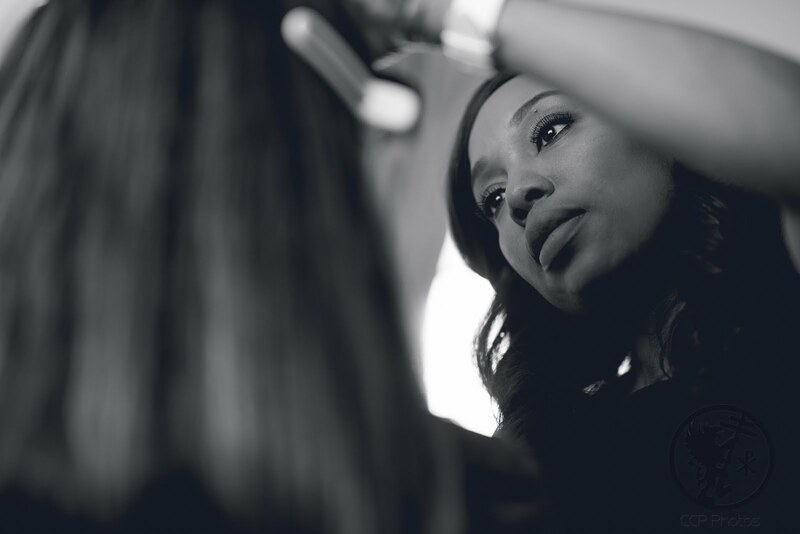 A bride also needs a talented photographer and gifted hair stylist. I selected two “sisters” as models because I wanted to demonstrate how women of color can wear neutral and light tones and still look stunning. African American women have skin tones varying from light to dark. So, when it comes to her wedding day, enhancing her beauty with professional makeup is definitely a must since she will be photographed all day and night. Colors of undertone may change slightly on different areas of the face, so having your makeup applied by a skilled professional is key. After reading my recent post on airbrush makeup, you will most likely want to use that technique to maintain your stunning look all night. Dancing Cheek to Cheek- For lighter skin tones, colors such as bronze, apricot, and even light pinks will look elegant and flattering. 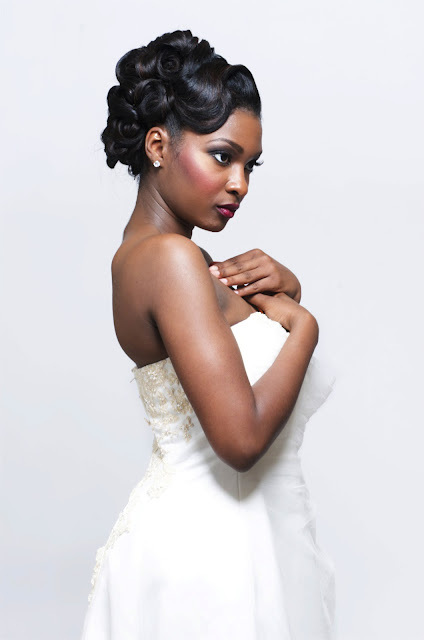 Deeper rose and plum colored blush compliments darker skin wonderfully. 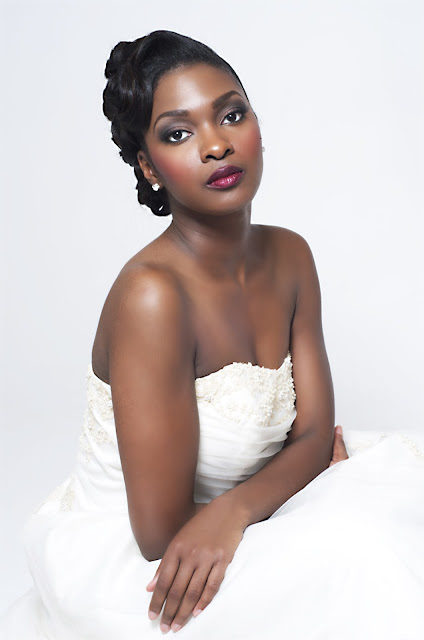 You May Kiss the Bride- Neutral lips can add the perfect finishing touch to a bride who has skin on the lighter side. For medium and darker skin, beautiful colors in hues of dark berries or various shades of red are just enough to make your lips stand out without looking too enhanced. Remember, this is the bride’s night to shine! A bride's wedding day is unquestionably one of the most important days in her lifetime. So, it's no wonder why she will choose a makeup approach to help her look and feel her absolute best, while having confidence that her makeup will last all night long. This is why many brides are opting for one of hottest trends in mainstream bridal beauty, the popular airbrush makeup technique. 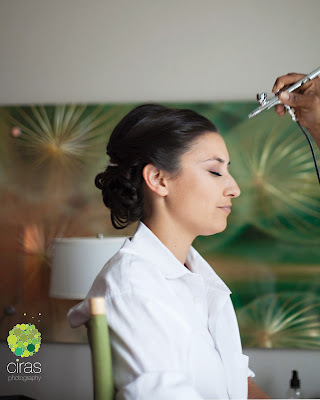 Airbrush makeup is a strategy where artists fill a specially diluted pigment into a very small spray gun that gently and evenly distributes lightweight foundation particles over your skin, creating an even, fresh, flawless finish. What is the difference between traditional and airbrush makeup? A traditional makeup application will consist of basic liquid or powder foundation, using your typical foundation sponge or brush. Most traditional foundations will need to be touched up and may appear thicker and heavier on the skin. Airbrush makeup is a specifically formulated lightweight foundation, and it is applied through a misting action providing impeccable results. What are the benefits of airbrush makeup? Most brides decide to use this popular makeup trend because of the long lasting effects and the ability to cover all imperfections. Airbrush makeup will not smudge or rub off once it's set, so touch ups are unnecessary. Worried about wedding tears or sweating? Have no fear. 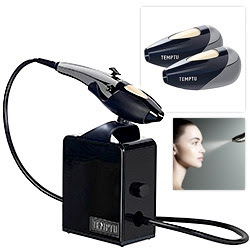 Airbrush makeup is water, heat, and sweat resistant! Now some women may need to visualize their thoughts, so have a look at these before and after photos to confirm why airbrush makeup is definitely the way to go! 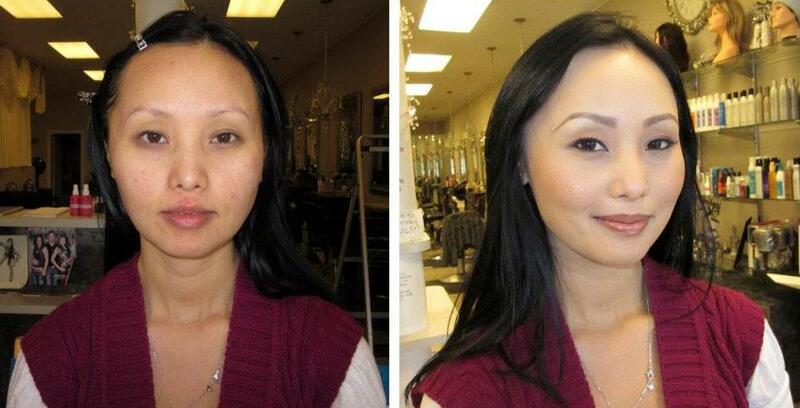 Do you think airbrush makeup is the best choice? Do you know anyone who has had airbrush makeup applied? Leave a comment & let me know! Makeup should reflect your personality. In spite of traditions, you should choose a look that reflects who you are. If you are a reserved woman, a minimalist, then the traditional look may be perfect for you. If you are someone who likes to make a statement and isn't afraid of changing your look (hair color, hair style, and experimenting with new makeup colors), you may want to try smoky eyes for your wedding day. "Smoky" does not necessarily imply black eye shadow. It's a misconception. Classic smoky eyes can be achieved with other colors such as browns (Sonya) and grays. This avoids the “goth” look. It is completely possible to look like an elegant bride with smoky eyes and not appear overly done. Top the look with some lashes, and apply a neutral lip color. This look makes for a gorgeous face, and you will be receiving compliments all night. Observe these stunning pictures below, taken by the talented Lara Callahan, for an example of how you can wear smoky eyes on your wedding day and still look and feel delicate. 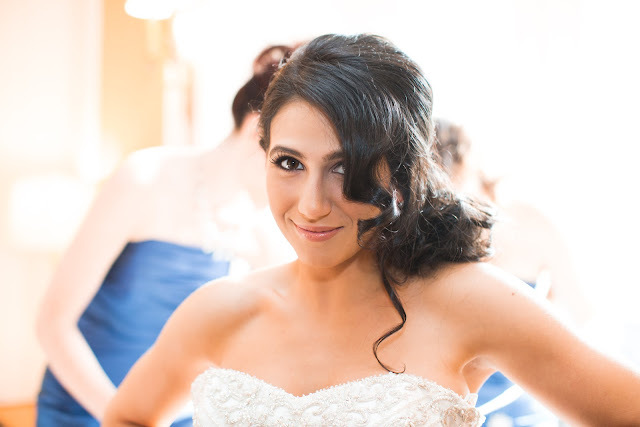 I am a professionally trained make up artist with a passion for bridal makeup. Check out my company website at www.makeoversbyligia.com for more information! 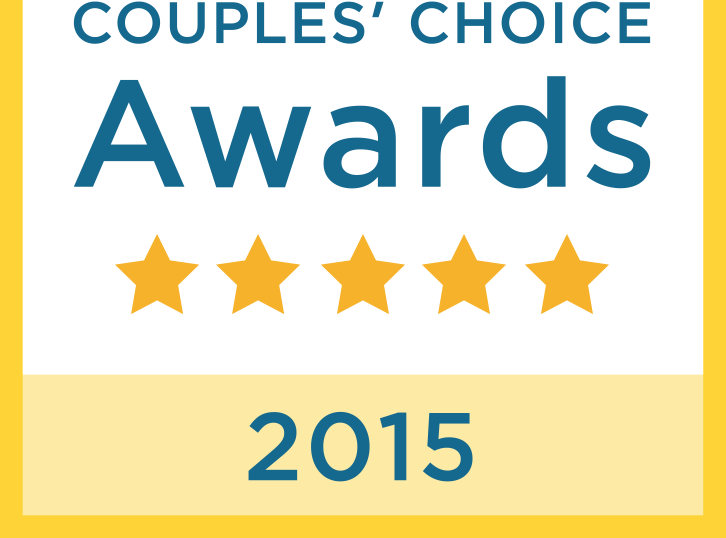 Boston's Best Makeup :: Why Are False Lashes Important? Blog created, designed & written by Holly Wolti. Simple theme. Powered by Blogger.